In Wednesday’s “historic market manipulation setting the stage for catastrophe,” my principal inference was that, per the time old adage, crime never pays. Perhaps in the short-term; but the longer a scam is perpetrated, the more vulnerable it becomes to its inevitable demise. Kind of like Fargo, when the initial plan to ransom Jerry’s wife morphed into a heinous killing spree, resulting in essentially all participating parties dying; as crime, like market manipulation, has significant unintended consequences, which must inevitably be addressed. Such as, the fact that the historic money printing perpetrated on the world’s 99% by the “1%” bankers has resulted in an unprecedented debt edifice that, to paraphrase JP Morgan yesterday, can NEVER be repaid. Not to mention, the equally unprecedented oversupply, of everything from commodities, to factories, to government itself – which can only be “repaid” by vast retrenchment, via the historic Depression that shortly, will envelop the entire world. And oh yeah, the “dotcom valuations in a Great Depression Era” said “historic market manipulations” have created – which must eventually reverse; likely, violently so. 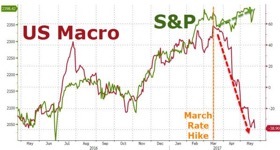 Perhaps one of the increasingly likely “black swan” events will be, as Jim Rickards puts it, the “snowflake that starts the avalanche.” Or perhaps, history’s largest asset bubbles – and conversely, Precious Metals “anti-bubbles” – will simply collapse under their own sheer weight. Then there’s the “Central bankers”; who continue to pretend they’re “in control,” despite the fact that the fiat toilet papers they “manage” are serially imploding – yielding collapsing purchasing power and global trade; historic asset bubbles; unprecedented wealth disparity; and burgeoning social unrest and geopolitical tensions. To wit, Helicopter Ben was again spouting off about his new favorite Ponzi scheme, the Japanese economy – in espousing that the Bank of Japan “may need to coordinate a new fiscal spending plan with the government, allowing for inflation to accelerate above its 2% target without worsening the debt burden.” This, as the Fed continues to pretend – if only in extremely vague terms – that it intends to unwind its $4.5 trillion balance sheet, if the economy, which just posted its weakest GDP growth in three years, “continues” to improve “as expected.” And don’t worry about the fact that the three miniscule rate hikes enacted in the past 18 months have directly caused such economic weakness; or that the tax cuts and fiscal spending growth that will supposedly reinvigorate it must be financed; or that the “debt ceiling” must be dramatically increased this summer to make this possible. I mean seriously, you simply can’t make this stuff up! That said, today’s principal topic is the “lie of all lies” that is the ongoing saga of the OPEC “production cut” that, per yesterday’s horrific crude oil plunge – which is accelerating this morning – is proving, once and for all, to be the historic, potentially Cartel-destroying failure I predicted it would be, from the second it was fabricated last Fall. Again, consider the fact that, from 1995-2005, I was a Wall Street analyst covering both Exploration & Production – i.e, “E&P” – and oilfield equipment, services, and drilling from the buy- and sell-side, the last six years, as an Institutional Investor ranked “oil service” analyst at Salomon Smith Barney. Where, I might add, I sat next to the number one ranked “Major” oil analyst, enabling me to learn a lot about the fundamentals of crude oil supply and demand. During that decade, OPEC meetings had as much impact on my business – and life – as Fed meetings do today; so trust me, I know as much about OPEC’s machinations – and vulnerabilities – as anyone. I vehemently believe that OPEC’s power not only peaked years ago; but that, for a variety of reasons, it’s influence is rapidly declining – to the point that, it may not exist by decade’s end. Frankly, OPEC lost its ability to control prices some time ago. However, with the help of the U.S. government-led “oil PPT” – quite obviously, “launched” early last year, when prices plunged below $30/bbl (threatening mass bankruptcies and bond defaults) – it has been able to delay this horrifying, but inevitable result. Even if, despite historic market manipulation; jawboning; and a fraudulent “production cut” agreement; they have still been unable to get oil to consistently hold above the key psychological level of $50/bbl. TRUST ME, if they fail to do so, it will have horrific political, geopolitical, and economic ramifications – starting with the permanent end of the Petrodollar; when America’s only remaining Middle Eastern ally, Saudi Arabia, fails to IPO Saudi Aramco, causing it to enter a dramatic financial death spiral. I mean, after Trump’s revolting state visit to Riyadh this week – to finalize an historic $350 billion arms deal – does anyone not realize how important the dying Saudi sheikdom is to America’s rapidly imploding hegemony? That said, this week’s big oil “news” was yesterday’s nine-month extension of last Fall’s OPEC/NOPEC production cut, following OPEC’s scheduled bi-annual meeting. Which the attending Keystone Kop “ministers”; not to mention, their “oil PPT” advisors; erroneously – perhaps, fatally so – believed would assuage inexorably rising oversupply fears. Which is exactly what is happening in the real world – as six months after the original agreement, global crude inventories remain at or near all-time high levels; whilst global production hasn’t materially declined; and say it ain’t so, demand is declining, given the aforementioned, rapidly-spreading Depression. Since gold bottomed in 1999 – with the heavily short bullion banks rescued from the resulting “abyss” by blatant, admitted government intervention – the “New York Gold Pool” has relentlessly suppressed gold and silver prices to promulgate history’s largest, most destructive fiat Ponzi scheme. In the process, they have taken the global economy to the brink of collapse – via the aforementioned explosion of debt and overcapacity – whilst the fiat toilet papers they “manage” have serially collapsed. And like the OPEC conundrum, their machinations have contributed to dramatically stronger Precious Metal fundamentals than when the scheme started. Thus, contrary to oil’s historically weak fundamentals, Precious Metals are now supported by historically high demand, collapsing mine production, and rapidly vanishing above-ground, available-for-sale inventories. This, amidst the aforementioned fiat currency contagion, which will worsen dramatically as Central banks are forced to step up their already record high levels of money printing, monetization, and rate suppression to prevent said Ponzi scheme from instantaneously collapsing. Which I assure you, it mathematically must; likely, sooner rather than later. In other words, just as OPEC is proving oil prices cannot be supported against historically weak fundamentals, the “New York Gold Pool” – which has repeatedly failed to push prices significantly below today’s historically undervalued levels – will be proven unable to suppress prices much longer amidst an environment of historically strong fundamentals; which ultimately, will yield dramatic physical shortages. This outcome is set in stone – with the only remaining variables being, the when and how this historically destructive Cartel epically fails.